OCG cares is a project of the Austrian Computer Society (OCG) in co-operation with other Austrian institutions. to get internationally recognised certificates. This project is in line with the aim, as it is laid down in the statutes of the OCG: Access to IT for all to be able to become part of the digital society. 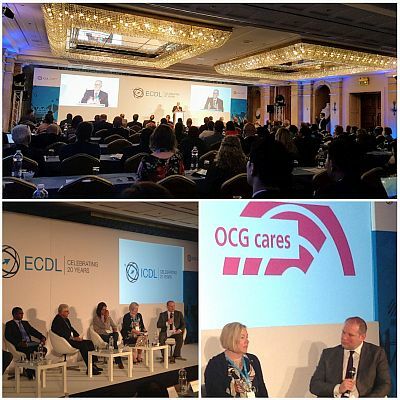 As the winner of the 2016 Best Practice Award, we had the chance to present our project at the ECDL Foundation Meeting in Malta to representatives from 50 nations. In the final session the OCG cares-Video was presented - it gives viewers good idea of the project. Video clips of other interesting Best Practice projects from Columbia, Malta, Yemen, South Africa and Zimbabwe gave an impression of ECDL activities around the globe. In the plenum the project leaders talked about the challenges and best moments of their projects. It was an honour and great pleasure to be part of this international group. Markus Klemen, who initiated the programme OCG cares during his OCG presidency, awarded the ECDL Certificates to the successful course participants. Moudar M. has earned all four ECDL Advanced Certificates and is an inspiration for all other candidates. The certificates have already helped all the refugees to find work or to start their university studies. Thank you to all the trainers who devote their energy and free time to this project, thank you also to Herdt Publishing house for providing the course participants with free learning material. The new courses are running - we look forward to awarding more certificates in summer! The Crossover-Course IT & Geman will continue in 2017! Thank you to our voluteer trainers Eva Supanetz, Thomas Baldauf und Reinhard Schuecker who have dedicated their free time to this project for a year now. Welcome to our new trainer on the team Doris Bäs-Fischlmaier, we are happy to have you on board! We are proud that five course participants have already passed the exams for three ECDL modules - and they will all continue their hard work! Our project won the ECDL Foundation Best Pracise Award 2016 and a film team was in our office to make a short documentary on the project. Team, trainers and participants are featured in the short movie. In May it will be presented at the ECDL Foundation meeting in Malta and we will post a link to it here! For our pilot project Crossover-Course IT & German we are always looking for volunteer trainers, so please contact us if you want to become part of the team. 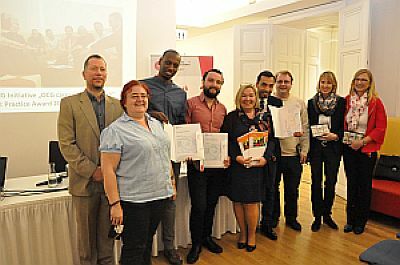 An initiative of the Vienna University of Technology to help asylum seekers to improve their computer skills. A project of the Private University College of Education of the Diocese of Linz to train refugees in German and computer skills. The German publishing house donates 1000 books for IT training. For our pilot project Crossover-Course IT & German we are looking for volunteers who can teach German and/or IT.